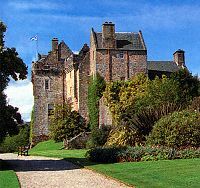 The castle was built on the site of a Viking fortress and part of it dates from the 13th century. The contents are magnificent and include superb silver, porcelain, paintings and sporting trophies. The woodland garden, begun in 1923 by the Duchess, is now home to an internationally acclaimed rhododendron collection. The walled garden dating from 1710 has been restored as a Victorian garden. The country park has waymarked trails, woodlands, waterfalls, gorges, wildlife ponds, a nature room and wildlife garden.